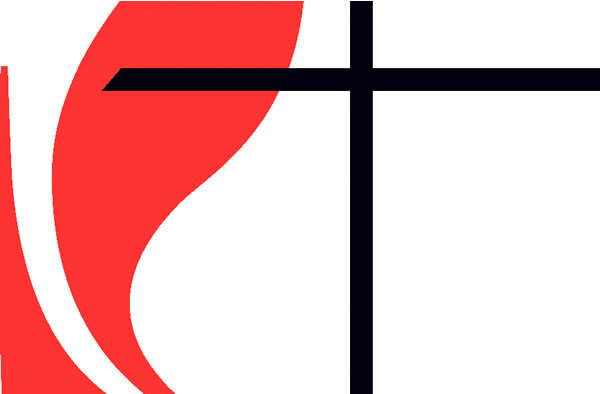 You are here: Home / UMC / Why do the Top 100 #UMC’s shun Methodism? I began to wonder if other successful United Methodist churches had the same practice: not advertising their UMC identity, at least online. And why? The church in question was a big church–in fact, it is one of the top 100 UMCs. Using 2011’s data, these churches average anywhere from 6700 to 1300 people on a Sunday morning. These are the luminaries, staffed by mega pastors (out of the 100….uh, 98 are men). They are often multi-site with many worship styles. They are mostly from the South, but there’s a good amount of Northern churches (only one Western Jurisdiction church, sadly). These are the cream of the crop and the churches that best utilize the United Methodist way of being to attract newcomers to the faith. If all the above is true, then my question is: are they shunning their Methodist identity online? Why would they intentionally remove their denominational affiliation from their online presence? Methodist Branding in the Top 100? Is the Church using the official Methodist symbol of the Cross and Flame in their logo or website? Is the Church prominently displaying that they are a United Methodist church (in their logo, in their about page, etc)? Only 34% of them had the graphic of the Cross and Flame on the front page. A whopping 66% didn’t use the Cross and Flame. That’s it. No about page, no history, no identification of the clergy as Methodist. 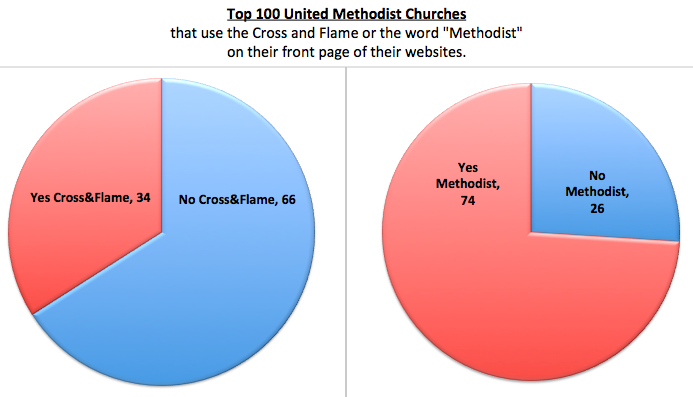 In all, 21 of the top 100 United Methodist Churches do not use Methodist branding for their websites. #5 White’s Chapel UMC in Central Texas has “UMC” in their URL, but their logo is just letters and there’s no mention of “Methodist” on their front page. They do mention being United Methodist in the first sentence of their About page, which is nice. #17 Asbury Madison in North Alabama has no Cross and Flame (just three stylized boxes) and only a small mention of Methodist in its about on the front page. “UMC” is in the URL, however. #48 St. Andrew Plano in North Texas has no Cross and Flame and no Methodist on their front page. They do overtly include Methodist beliefs in their about sections. #54 Good Shepherd Charlotte in Western North Carolina has no Cross and Flame and no Methodist on their front page. They include reference to “Wesleyan” in their about section, and “UMC” is in the URL. #82 Lee’s Summit UMC in Missouri has no Methodist branding but their page header includes “United Methodist” in the title. 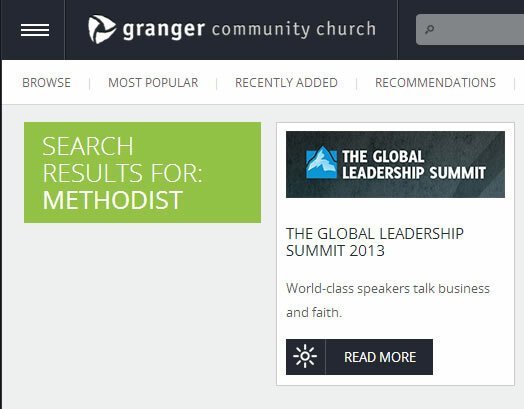 They call themselves “The Summit Church” throughout the website, otherwise. #85 Bethany Church in Pennsylvania has no Methodist branding but their URL includes “UM” in it and their about has “Methodist” in it. Otherwise they call themselves “Bethany Church” throughout the website. # 11 Glide Memorial UMC in Cal-Nevada has no mention of UMC, no Cross and Flame, and very little Methodist references in their website other than the pastors’ bios and their history. #18 Jacksonville Beach in Florida. Methodist only shows up four times on their website. # 21 Van Dyke UMC in Florida. Methodist only shows up five times on their website, each time reporting on external groups. #32 MorningStar Church in Missouri has no Methodist anywhere in about or intros other than the pastor’s bios. #38 La Croix Church in Missouri has no Cross and Flame and no Methodist anywhere other than their history. #43 Covenant UMC in North Carolina has no Methodist anywhere at all. #57 Crossroads Concord in Western North Carolina has no Methodist anywhere other than the history. #64 Gateway Community Church in Texas has no Methodist ANYWHERE at all on their website to reference their own church. No. Where. #78 Covenant Glen UMC in Texas has no Methodist branding at all and mentions it only in their beliefs and their pastor bios. Your Turn: Marketing or Theology? I wonder about the reasons for this lack of Methodist branding. It could be marketing. Click through the linked websites above and you’ll see the fancy header graphics and some nice logos for their churches that they decided the UMC images didn’t fit into. To compete in a world increasingly hostile to organized religion, perhaps eschewing official involvement (at least online) is helpful to their local evangelism. And let’s face it: just saying “a cross and a flame” evokes more images of 1960s KKK rallies than hearts strangely warmed in Methodist pews. Maybe it is okay that the denominational image is falling out of style and we need new branding in 2016. It could be theology. Are these churches out-of-sync with the greater denomination? On one hand, some see themselves as staunchly Methodist. At least two of the pastors of the churches mentioned above are so-called champions of United Methodist values as signatories to the FaithfulUMC petition–and yet they don’t champion United Methodism in their branding on their own local church. On the other hand, at least two United Methodist churches in my town have recently removed United Methodist branding from their Facebook pages. The pastor explained to me that it was intentional because the UMC’s stance on homosexuality was a turn-off for visitors and they needed to know that the Reconciling churches were not like the rest of Methodism. As you know, this blog celebrates our connectional nature. While I’m certain that in person the Methodist presence oozes out, online is my realm of interest and it seems these churches have abdicated a Methodist identity that could do a great deal to remind the world that we aren’t all about debates about homosexuality and being the church of Bush and Clinton. If these are our Top 100 churches, why aren’t they choosing to be more Methodist online? So what are your thoughts? Why would churches not reflect United Methodist branding and identity online? And is that okay that our denominational staples of the Cross and Flame–and even the name “United Methodist–are not getting the traction they used to have? Discuss. Thanks for your comments. UPDATE: Followup to this post here where we discuss why UMs would want to disaffiliate themselves from the mothership. I think most mega-churches are trying to get away from denominational labeling. I’ve seen several First Baptist Churches becomes First Family or First Community Church and the same with other denominations. Their assumptions is that the denominational name brings a lot of baggage. While I certainly think that if you are a UM church connected with an annual conference that you should at least call yourself United Methodist, the more disturbing trend is that this mega-churches are moving away from other UMC staples like itinerancy and trying to reconfigure connectionalism to their benefit. In my own AC, some of the larger churches have tried to change to direct billing of clergy healthcare and pension and change the way at-large lay delegates are distributed among churches, two moves that would greatly benefit them and greatly damage small and medium sized churches. My opinion is that you can’t have your cake and eat it too, if a larger church is going to benefit from the UM pension, health insurance, etc then it should also call itself a United Methodist church. Brad – in the LA Conference, which doesn’t contain very many large churches, we have direct billing of healthcare and pension. The pensions are slightly subsidized through apportionments, but the majority of it is direct billed. The healthcare is not subsidized at all (unless you count the reserve fund which is sometimes used). I don’t see this as a big vs little church issue, but as a fairness issue. On your other point, I agree that if any church is UM, they should call themselves a UM church in some way. I think this is all about marketing. I see a prominent church in or near me that has lowered the UM in its name to between the other names of the church. I am fine with that. I don’t think it makes any difference. I believe the church I refer to is following the tenants of the UM church. Can we get UMCom or GBOD to release a more layered cross & flame? I don’t use it that often because it is a flat digital logo circa 1970’s/80’s. Agreed. Cross and flame logo is out of date. We have our own — although we’re also proudly known as the “Mother Church” of Georgia Methodism (we have a rock in our courtyard that says so). Actually, GCFA are the keepers of the flame, as it were. At least legally. Not sure whose decision it would have to be to redesign. Our church just did a redesign of our logo. During the process it came up that the BOD clearly says that churches are permitted free use of the logo however are also prohibited from making any changes to it. So technically we could get in trouble with GCFA. However most churches and even conferences that do use the cross and flame these days are doing altered versions of it. Perhaps that weighed in but I suppose it has more to do with the fact that the average person that we are trying to reach with a message about Jesus doesn’t much care that we are United Methodist. Very solid discussion, and important, too. Everyone knows that institutional “brand” loyalty has been way down for two generations. In the supposedly glorious days, kids who grew up Methodist would move to a new town after college and immediately find the Methodist church. Almost no one does that anymore. And in the unlikely case that someone raised UM has an inkling to return to church years later after having 2.3 kids and settling down in the suburbs, there’s a lot of competition. I suspect that the First Baptists, Grace Lutherans, Wesley Memorial United Methodists, etc. all start to look alike: barely surviving in their inner ring suburbs of the 1960s. The exurbanites see a whole host of Jesus barns with names like Living Waters, The Rock, The Vine, Community of Joy, etc. The unaffiliated evangelicals started this trend, but the mainline caught on. To me, the problem is that it conceals the difference between mainline and evangelical churches. I know, basically, the difference between “First Southern Baptist Church” and “First United Methodist Church” in any town. But I don’t know the difference between The Rock Church and The Vine Church. So my concern is that our biggest and most “successful” churches are, right from the start, blurring the distinctions between us and the fundamentalists. On the other hand, I suspect a number of clergy and laity in these churches are aware of and active in the UMC connection. I don’t think it is a theology thing because neither glide nor granger use methodist references. My guess is that it is a marketing thing. Glide has a great logo. It clearly represents who they are. Granger’s logo is too generic for my tastes. Windsor Village in Houston has a good logo, no cross and flames. It is probably also an 80s thing. That’s when a lot of churches went through the “marketing” phase. Personally I am with Gavin. I like the cross and flame. It identifies, but I wish they would update it. Graphic design has changed since the 70s and 80s. When looking at reworking our site, none of the cross and flames were scalable, transparent backgrounds, or adjustable. Churches like a certain degree of control over their logos. I think it is mainly a marketing thing, and it gives a chance to define “United Methodist” in person through relationships instead of through perceived past experiences. I also hope that we connect people to Christ first, then lead them in the “United Methodist” way of following Jesus. On my most cynical days I worry there is more commitment to UM traditions/structures/bureaucracy than to Christ and God’s mission. That’s quite a negative judgment on my part, so take that more as sensationalism than honest truth. Another thing I think about is that Pre-Protestant and pre-east/west splits, it was just church, no denominational label. So, overall, I don’t think it’s a bad thing. It’s simply a church being church in its context. “I think it is mainly a marketing thing, and it gives a chance to define “United Methodist” in person through relationships instead of through perceived past experiences” = BOOM. Well said. I’d say its a marketing thing as well. I recall in the late 90s/early 00s there was some church marketing consultancy that was sweeping through my home town in Indiana offering some ‘free consultations’ on how to better market your church. It was all about dropping denominational references and even other explicitly ‘religious’ references. My home church was advised to drop the word ‘chapel’ from their name as well, being told that it evoked a ‘small church mentality’ that would not attract new worshippers. The logo is SO 1960’s. It’s recognizable to UM’s, but not so much to the secular culture. For fun, take a look at a few corporate logos from 1968 and today. Imagine McDonalds today with its 1960-68 logo: http://logos.wikia.com/wiki/McDonald's. The phrase “United Methodist” is six syllables (“United” referring to the 1968 merger, and “Methodist” needing a lesson in 18th Century English campus religious clubs to explain. That’s really quite a bit of baggage to offer in the church name … but I’m convinced that it’s important to include it on the frontpage and available to search keys — people move to town and look for UMC’s. People who aren’t UM don’t need polysyllabic historical mysteries in the masthead. But both the name and the logo — more current versions would be welcome! — should be on the frontpage, and (imho) on each page. “United” came to the EUB by way of another merger between the Church of the UNITED Brethren in Christ and the Evangelical Church in 1946. The CUBC name came about in 1800. Shun? Really? I happened to be the Lead Pastor of one of these 100 churches and this language is way too strong. I cannot speak for all the large church pastors, but I personally know many of them and they are rabidly committed to the UMC as a whole. Their churches host conferences, write books and curriculum, mentor pastors and churches and serve in the Annual, Jurisdictional and General Church. So, we leave off the logo or drop the “United Methodist” from our name. We did it because it shortened our name. That’s it. We have a thirty foot cross and flame in our Sanctuary! Let me also remind you that without the growth of many of these local churches, the UMC would be in worse shape than she already is. Plus let’s not even talk about the amount of apportionment a these 100 churches pay. Jorge, thank you for your comment. While the title is provocative (as longtime readers expect on this blog) the focus of this conversation is on online presence, not the rest of your substantial contributions to United Methodism. As more and more people find us online, what role does UM branding play in online strategies? What led to your decision? Jeremy, I don’t think you can separate “online presence” from the rest of a large churches contribution to the church as a whole when you are talking about them shunning the UMC. But let me respond at a deeper level. As you probably saw, we make no bones about the fact that Grace Church is a multi-site United Methodist congregation. But I agree with many that most unchurched, once-churched and over-churched people are not denominationally loyal. Our bent is towards them first. Branding as a UMC is secondary to helping connect people to Jesus Christ and helping them grow in their discipleship. Also, I think we have to distinguish between being a loyal United Methodist (whatever that means) and teaching people to walk in the Wesleyan way of discipleship. Frankly, I care little about the first but I’ll give me best efforts to the second. I think that’s fair, Jorge, and thank you for further engagement in this conversation. My comment is that if your parishioners are like mine, they are more mobile than they have been in the past and move around more often. I don’t know about Florida but in Portland, Oregon, about half of my transfers of memberships are from fellow UMCs who move to a new place and look up “where the Methodists are?” It used to be that you could visit a UMC in one town and then another a few states away and you would know you would get the same type of message. The denominational branding assisted back then, and it surely would have even more of an impact now. The driving question of that paragraph perhaps is this: in a more mobile society, is it better for churches to stick it out alone and market to their communities? Or is it better to retain more uniform branding so that folks can more easily retain their UM affiliations when they move? Jeremy: I think dyed-in-the-wool United Methodists will find a UMC to worship and serve at. Reaching transfers is not the mission of the church. Reaching lost, disconnected people with vulgar grace is. I think being clear about our mission, vision, values and strategy says more about individual UMC’s than a brand or logo. Reaching transfers isn’t the mission of the church, no. Making disciples is. And the reality is that mobility and internet savvy impacts our church decisions of how to make disciples. My perspective is this: Fewer of our parishioners will be our lifelong disciples-they are more mobile and will become someone else’s disciples. More than ever we are indebted to other UMCs for sending and receiving those laity and planting them in new places or receiving them in ours to assist in reaching new people. If a church’s website is unrecognizable to UMs, then how do we facilitate a lifetime of discipleship when they may not come to a church that doesn’t “look” Methodist online? I’m certain we are coming at this topic of branding from two different angles (evangelically versus discipling, though they are 95% alike). I just want Grace’s successes to reverberate throughout Methodism’s online venue of the Gospel as clearly as it does offline too. Good discussion, Jeremy. A deeper problem is that the UM brand means little or nothing today. Apart from the fact that there is low “brand recognition” among unchurched people, there is no longer brand uniformity among UM congregations. When I move to another community and attend another UM church, chances are it will be different in theology and worship experience from the UM church I moved from. Just having the UM label doesn’t mean that potential worshipers can count on what type of experience they will have when they walk in the door. I think it’s very simple: what does having “UMC” or “Methodist” mean to an unchurched person? They have no idea. That’s something you don’t want them to Google. You want them to get a personal understanding of how we live out our theology. For instance, our church (First UMC of Sikeston) has a large contingency of former Baptists. It was only through personal relationship and experience that those theological differences were reconciled. Without local church success, connectionalism is meaningless. What’s best locally IS best across the connection, if it furthers the kingdom. Great discussion. I remember when I attended the New Church Leadership Institute put on by the the SC Jurisdiction, a “church marketing guru” questioned why some churches decided to drop “United Methodist” from their name b/c the term consistently “tests well” in surveys. His point being that churches have nothing to gain by joining the increasingly majority “herd” of having no denominational affiliation in their church name, and that “positive correlation” to gain by including it. I’m sorry I can’t remember the surveys he spoke of, but perhaps someone else does. We kinda do the opposite of what some here have mentioned–intentionally include our UM affiliation via the cross and the name on our website, and then refer to the church as “University Church” while people are at worship, etc. b/c it rolls easier off the tongue. I think people know where they are after walking into a building with a big cross and flame on a 7 story tower. I never closed the car screeching noises either 🙂 oops. I suspect it’s a misguided marketing perception in many cases. But it’s not only churches. You and I are both acquainted with a United Methodist university that doesn’t feature the symbol in any prominent physical location on campus (and indeed has the word “Methodist” in very few places visible externally on campus; one of them because it’s a dorm name). The cross and flame is visible in a small button at the bottom of the first website page connecting to the church relations and religious life office; the connection to the church and a link show up on the “About” page. Southern Methodist University refers to itself by its full name with the word “Methodist” only once at the bottom of its front page and mentions the church only in connection with its founding on its “About” page. Some churches have probably made this as a decision something like Jorge notes; denominational branding is secondary for many non-religious folks and so many churches choose to emphasize it less in reaching out to them. Some, though, probably omit the symbol and the word because they feel it constrains them into roles they do not wish to have or to be perceived that they have — which is also, I think, at the root of some of our schools and universities’ choices to reduce their overt connections to the connection. Crosses and flames? Say those two words together: crosses and flames. While those who are “Anglo insiders” know the UM logo as the intersection of the work of Christ and the ministry of the Holy Spirit, the two terms and images converge into a very different meaning for our African-American friends. And as one of the churches on “the list” going unapologetically “full color” in our demographic makeup, we have opted for a logo with a very different feel and with no cultural or racial baggage. Some black Americans choose to not use the Cross and Flame b/c it’s too close to a Flaming Cross which was used for generations to intimidate and strike fear in the hearts of the black community. That might be Glide’s rationale – perhaps. I would just like to point out that other denominations within the Methodist family tree use some variation of the cross and the flame as does the Presbyterian Church with a flame on each side of the cross and a descending dove on top of the cross. Soo are we proclaiming Christ or Methodism? What’s the point of the article? It is human nature to organize around a value. To worship Christ in an organized way with other folks is perfectly human way to be in relationships. Whether a UM congregation has the words “United Methodist” or a cross and flame logo on their sign or web site is really immaterial. What matters is if and how they form people as disciples of Jesus Christ. Do they have an organizational culture that expects, enables, and supports growth in holiness of heart and life (small groups that are centered in Jesus Christ and discipleship, developing disciples who disciple others, teaching and practicing the means of grace)? Are members equipped to live the Baptismal Covenant and serve with Christ and his mission in the world? Is the Lord’s Supper integral to worship and Christian formation? Are members conversant with the General Rules? Do leaders, lay and clergy, have faith in Christ? Are they going onto perfection in love? These expectations and practices are far more important than whether the congregation uses United Methodist or the cross and flame on its web site. I find in my work at GBOD that the vast majority of UM congregations are Methodist in name only. The laity are not aware of the richness of the Wesleyan tradition. I have also found that most lay men and women who learn about the Wesleyan way of Christian formation, discipleship and mission get very excited and enthusiastic about being Christians in this tradition. It’s entirely possible that certain congregations which don’t overtly identify themselves as United Methodists may actually show more fidelity to riches of the Wesleyan tradition than congregations which readily identify as UM and use the cross/flame logo. Some of the congregations you mentioned are well-known to practice incarnational solidarity with the poor, marginalized, and dispossessed of Empire (a commitment of John Wesley’s), while there are certain mega-UM churches here in the greater Dallas area—fully emblazoned with the UM logo—which, as far as I can see, are doing little more than reproducing the middle- to upper-middle class white-privileged status quo. What I find disturbing about this blog post, along with the set of responses, is that there seems to be more hand-wringing over whether or not congregations overtly use the UM logo than over another fact the blog revealed here, namely, that out of the 100 mega-pastors, only two are women. Only two!??? And no one finds this noteworthy, or something to get upset about? What the church “normalizes” and ceases to notice—and what it does notice, and gets upset about—is very revealing. I’m deeply disappointed that no one seemed to notice or get concerned about this statistic—for it’s a symptom of a much larger societal problem. According to scripture it’s entirely possible to tolerate a big log in one’s own eye, and get worked into a froth about specks out in the environment. Yes, it’s important that at some point congregants be helped to understand the significance of the denomination to which they’re connected. But, to my mind, the ongoing subordination of ordained women in the church (a White House report shows that women comprise no more than 15 to 20% of upper level leadership in 9 major professions) is of far great significance and concern. Has anybody gone to the trouble of doing a statistical analysis, and doing a careful assessment of percentages of women (and people of color) in roles such as senior minister of medium to larger congregations, Bishop, and so on? Let’s pay attention to that. “subordination of ordained women in the church”????? Only 20% of the elders in full connection are female. Yet, more than 20% of the bishops are female. More than 20% of the district superintendents are female. So, where is the subordination???? I’m not trying to say that we have defeated sexism or racism for that matter. But, let’s look at the realities instead of trying to find talking points. Which leads me to the question about the top 100 churches or even all of those with more than 1,000 members. The study that was done (by GBHEM?) neglected to look at the question of how many of those churches still had their founding pastor? It is one thing to talk about mature (but hopefully still growing) churches and how appointments are distributed. It is another to suggest that successful church planters should be moved to “prove” that we believe in itineracy or to give everyone a chance. While that may benefit a “fortunate few” it would be very damaging to the church as a whole. On your list, #69, Christ Church. If you open their site on a new tab, the tab comes up as “Christ United Methodist Church”. Then if you scroll about half down on their homepage, there is a cross and flame. I truly believe that the approach is theological. Marketing is part of it, but likely secondary. We’re committed to Jesus, first. Not denominational affiliation. This has always been the case. I’m reminded of CS Lewis’ image of a house with many rooms representing our different preferences, denominations, etc. When we say the room we’re in comes first, we minimize the whole house. When we start with the house (Jesus and His Kingdom), we can then help people find a room to belong in. Frankly, I just don’t understand why this seems like such a big deal. The way it seems to be interpreted is that these churches don’t love their UM connection. This isn’t usually the case at all. Not shouting it on their website is not shunning Methodism, it is promoting Jesus as the most important thing. It could be like you say, but the purpose of this post was to do exactly what you didn’t do: go beyond a cursory inspection. We looked at 100 church websites and reported above what we found. While your anecodotal evidence is helpful to the conversation, the data supports a different conclusion. Being one of the churches listed … our main goal is to reach the unchurched. Not the churched, not the folks that have church homes, not United Methodists transfers (though we will gladly take them as well!) … And so we don’t want anything to serve as a barrier to enter our doors. We do not shun the denomination by any means, and we actually talk extensively about our denomination in person. However, we do not show the UM logo because we do not want someone to not enter our doors simply because they would feel like they don’t belong. Because they don’t know what the beliefs are of UM, because … of what ever other reason. So again … it’s about our mission. Reaching out to the unchurched. We are very grateful and blessed by the support of UM. Hope this sheds some light. You know, I think it’s a problem. I have ‘liked’ a few of these churches on Facebook. I have read their Pastors books and kept up with them. I remember once, one of those mega church Pastors wrote a piece of homosexuality in the church. It, naturally, sparked quite a discussion. Among those, though, was a discussion among MEMBERS of the church, some of them claiming to have been members for YEARS, asking the Pastor if “he allowed gay weddings in the church”. They had never seen it done, but they had no idea. I waited for a response from him and never saw it. His piece was a beautifully written piece in support of homosexuality. But it would seem his church, a large, United Methodist Church, had no idea that there was a prohibition on gay marriage. Furthermore, none of them asked “Does the United Methodist Church prohibit gay marriage”, they just asked if his church banned it. As far as they understand, they are a congregational church! I think they are trying to reach the “I’m spiritual, not religious” group, the group that rejects “organized religion”. Not only are they lying to these people, though, they are also presenting pretty false pretenses. Do people not realize there are committees and organizations that run those churches? Dozens of paid staff persons? More staff than their conference and district offices perhaps? Most of these mega church Pastors get elected to General Conference. Is their seeker-friendly congregation aware that their Pastor has been asked to be a part of the decision making body in the United Methodist Church? Do they even KNOW there is such a body? I can go a little easy on them. There are folks in my congregation who don’t know much about Methodism, even though I just got done with a sermon series on such. But I’ve always been uncomfortable with the way large churches hide methodism. I’m a 23 year old “millennial” serving under appointment and have since I was 19 years old. I was a southern baptist until I felt my call to ministry. I wrestled with my own theology and knew it couldn’t be in the church I grew up in. Methodism was relevant. The quadrillateral, the organizational structure, even General Conference- it all made sense. Rather than telling me to be afraid and submit, it told me to learn and grow. I grew up having the answer to everything at my fingerprints. I was the ‘geek’ who was building computers in elementary school and my family was the first on our block to have internet. I’m used to finding answers and learning. For 200 years, seeking answers to questions about the Bible has been the message of Methodism. Growing in holiness, becoming a better person, and becoming closer to God is what it’s all about. If we are trying to reach *me* and my generation, like folks keep telling me, then why aren’t we playing on our strengths? Why are we hiding our identity that resonates with so many people? I feel disappointed every time I see “HIP COMMUNITY CHURCH” (a united Methodist congregation). Why are they embarrassed to be a part of the church that I love? Why aren’t they embracing the tradition that people want and need? Why aren’t these large churches overflowing sources of future United Methodist clergy and leadership? Our LARGEST is the United Methodist Church of the Resurrection. While at times it embodies some of those same issues, I have more than once heard Rev. Hamilton preach about Methodism. He is not ashamed to be a United Methodist! He refers to COR AS “The United Methodist Church of the Resurrection”, he lets his congregation know about his role in the UMC and in fact, if you visit their website, not only will you find a prominently displayed Cross and Flame (as you will in the building), you’ll find that one of their missions is to renew and revitalize the mainline church and the UMC. So if our LARGEST church can be comfortable in it’s denominational skin, and make big impacts in the world; then why on earth can’t all of our churches? Why are we embarrassed by our denomination? I for one am not. I can’t wait to tell people about my United Methodist church or the fact that I serve as a United Methodist Pastor. Sometimes they’ll say “But, isn’t that the church that believes…” and I cannot WAIT to help them better understand our complex, multi-dimensional beliefs. It’s amazing how many people not only resonate with it, but find it so refreshing that denomination doesn’t have a simplistic, basic answer for everything! Well, that’s the end of my tirade here! I hope and pray that our UM churches would embrace their identity. We are the church that people need. If we don’t believe that, what are we doing here? Working full time in Youth Ministry with the UMC, I believe that it’s completely about marketing. Before I came on full time, I was working 3/4 time in a national big-box hardware store. And the part that blew my mind and perspective was upon being asked what church I served the youth at and telling them First UMC, more than a half dozen millennials responded with, “Methodist? Wait. I thought you were a Christian?” I was shocked that they didn’t understand the relationship. I wish that we didn’t have to run around the tradition of the UMC, but most of my generation don’t want to join something for its organizational tradition. They simply want to know more about Jesus Christ. I go to Glide Memorial. No, we don’t have the cross and flame. No, we don’t have “United Methodist” prominent on our website. You know what we DO do? Serve 3000 hot meals a day to homeless in San Francisco’s poorest neighborhood. Provide free health services. Operate low income housing in a clean and dignified environment. Help women escape abusive relationships, and men overcome violence. Substance abuse recovery services….. the list goes on and on. So, you know….. if your priority is on marketing rather than following the example of Christ, I’m good choosing my church over the UMC if anyone feels the need to push the issue. Give me a church that follows Jesus’ teachings in actions over words over one that has website designs with the logos you prefer. I came back to church after 30 years away, and I could only do that at Glide…. the only church that respects my dignity, even here in the San Francisco Bay Area. It astonishes me that your priorities are on brand identity over Christ’s teachings. But I know which I find important, and if the UMC has a problem with it….. I’ll stick with those who feed the hungry, house the homeless, and clothe the naked over those who adhere to a Pharacitic bureaucracy. Amen Christa! Blessings to you and the many Jesus-like ministries at Glide! I have been a United Methodist pastor for 42 years. I have represented my Conference at three General Conferences and four Jurisdictional Conferences. The “United Methodist” name has become a serious hindrance to church growth. It is my biggest obstacle to overcome in order to get prospects to consider coming to my church. That is because of the liberal progressive theology of the leadership of this denomination. Liberalism, and the failure of our bishops to uphold the Scripture or enforce the Discipline is fast killing this denomination. I weep over that. Sorry for the four-year delay…just read this blog. I am UM today because of Wesleyan Theology—not the dysfunctional systems within the UMC and its boards and agencies which do very little if anything to help the local church accomplish its mission of reaching unchurched persons and making fully devoted followers of Jesus Christ. When Wesley first wrote “The Character of a Methodist” he called the document, “The Character of A Christian”. When the Book of Discipline was first written it was called, “The Book of Doctrine and Discipline”. It was 3/4 doctrine and 1/4 polity. It is now 3/4 polity and 1/4 doctrine. Our problem in the UMC is not our marketing…it is our Christology. Yes, Wesley died an Anglican–but he was first a citizen of Heaven and a practitioner in the Kingdom of God. This is what it means to be Methodist!